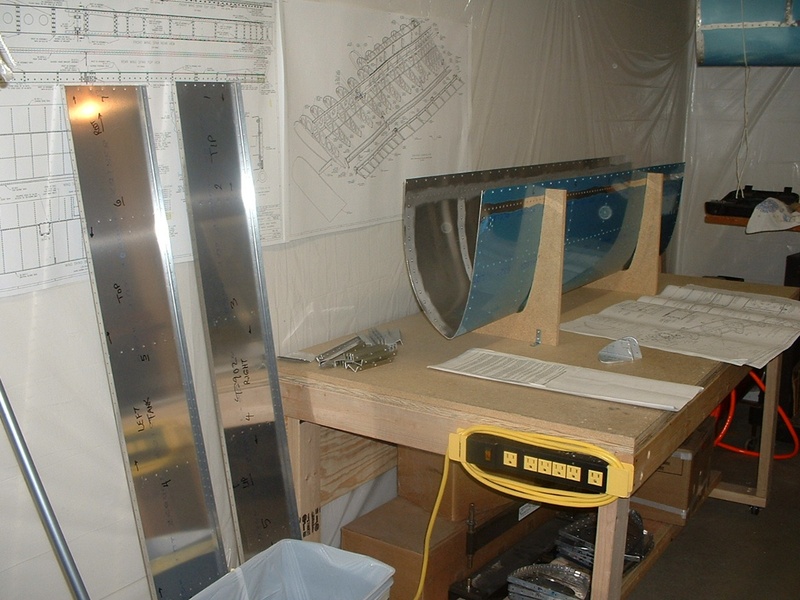 RV-9A wing kit - page 8. WING KIT CONSTRUCTION - Photo Page 8. 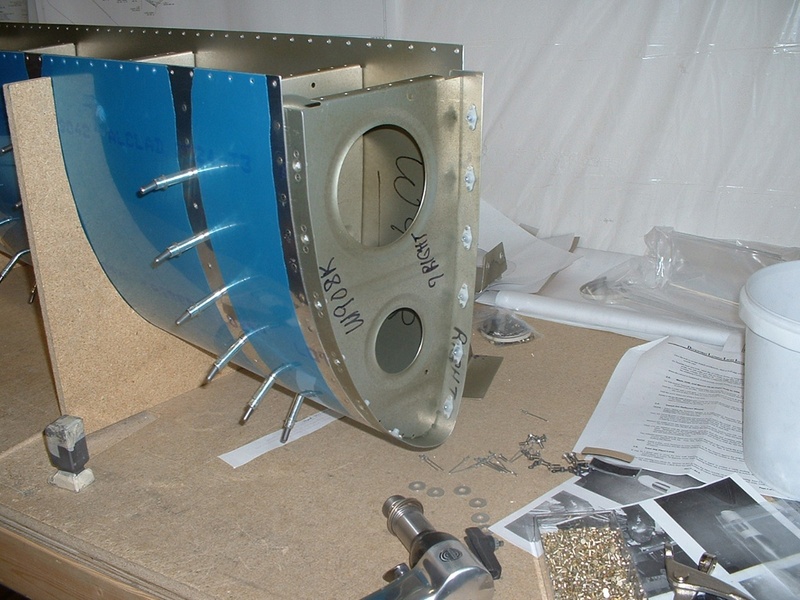 February 24, 2003: A really beautiful day outside today - perfect for finishing up all the spray priming of the remaining wing skins, the landing light brackets, and a few other parts that needed a touch up. And finally - RIVETS! Yes, the RIGHT wing leading edge skins and nose ribs now have rivets in them as real assembly finally begins. It feels good to reach another milestone, at least in my mind anyway. The weather is going to be bad tomorrow, and that is just fine with me as the garage is insulated and I am ready to do some serious riveting on this leading edge assembly. And here are all the wing skins other than the two that are on the right wing skeleton and jig right now. That Sherwin-Williams wash primer green tint is on all of them now, ready for riveting, etc. I just realized that there are two clecos in this picture. I was leaning over the wing on the jig to take this snapshot. I will have to pay more attention to my photography. All those ribs there are for the LEFT wing, as are most of those panels. 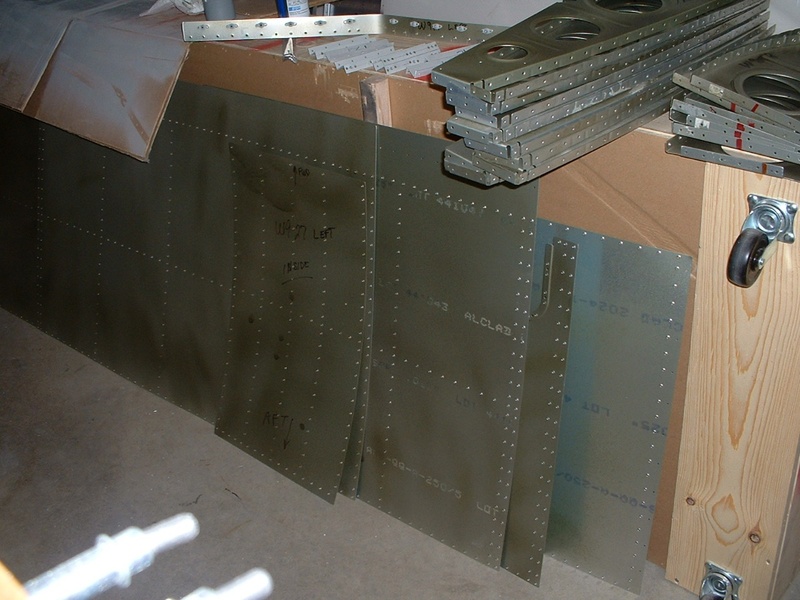 February 27, 2003: I finished padding the wing cradle that I made from the 8-foot-long shipping crate that originally contained the wing skins, wing tips, etc. You can see both of the leading edge skins now have all the nose ribs riveted in permanently, and the landing light kits are installed. As you can see below, it is time to start working on the fuel tanks. I have the sealant to use during the assembly. If the weather is good enough tomorrow, I will go outside to use the solvent for cleaning the tank skin and components. All the wing skins are in the crate/cradle out of the way. 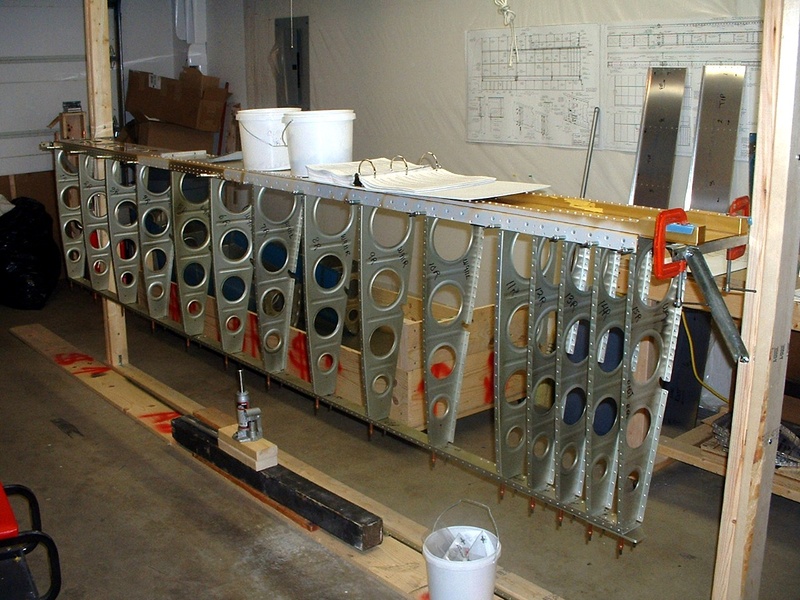 The wing skeleton is also at that stage when it is time to start putting in rivets. 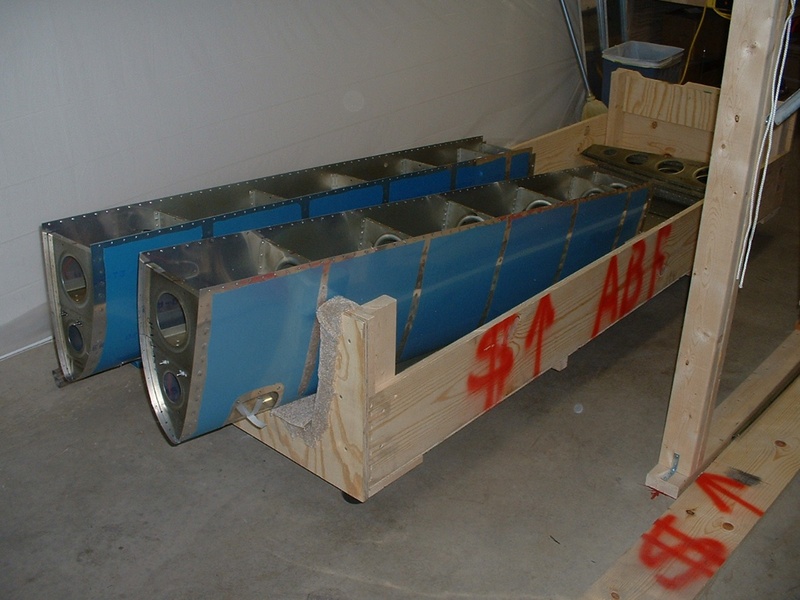 After that, it will be a two-man job to move the wing off the construction jig and into the cradle, etc. It would appear that I will have to start opening the garage door to move the wing cradle from its storage location to a position on this side of the wing jig where I can easily move the wing from the construction jig to the cradle. The total work time on the airplane is now over 312 hours. If all the prep work of building the work bench for the drill press, bench grinder, band saw, the work table, and the wing jig is included, the total time is over 351 hours.